This is a variation on yet another recipe from Rick Stein’s current and excellent Spanish cookbook. Variation because gone is the tarragon (tarragone?) as we didn’t have any growing in the Victorian walled garden here at Yumblog Towers and ditto the carrot*. Plus we decided to construct one big fat tart rather than 12 individual dainties. 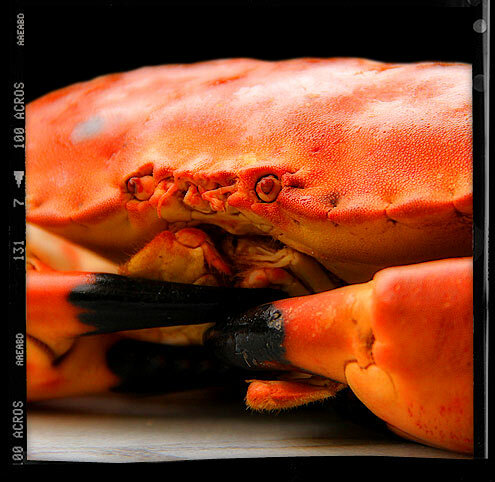 However despite these omissions, this turned out to be one of the tastiest (and definitely crabbiest) Saturday night dinners eaten by ours truly since records began**. 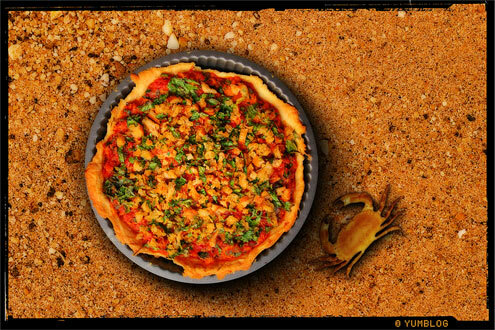 Preparation time: 30 minutes to an hour depending on your skill at dissecting a crab. Start by making your pastry. Sift the flour and salt into a mixing bowl and add the chilled butter, cut up in small pieces. Rub in the butter until you have the usual fine breadcrumb texture. Stir in the water with a rounded knife until it comes together to form a ball (it’s a temperature thing so don’t be tempted to use your fingers). Turn out onto a lightly floured surface and knead briefly until smooth. Wrap in clingfilm and refrigerate until needed (it’s best left at least half an hour before using). Lightly grease a shallow 30cm tart dish. Roll out your pastry very thinly to a circle large enough to line the dish. Trim off any excess pastry, line with a circle of tin foil and blind bake for 10 minutes or until golden brown. 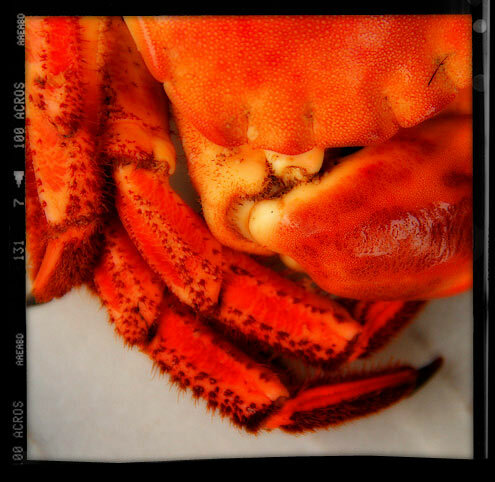 Next catch, kill and boil your brown crab … or alternatively buy from your fishmonger/Waitrose. Remove all the white meat (you should end up with about 200g) and set aside. Place all that remains of the crab (APART from the back shell) in a pan and crush slightly with a rolling pin. Add 2 tbsp of oil and the bruised garlic and fry over a high heat for 5 minutes. Add the canned tomatoes, wine, brandy, bay leaves, stalks from the bunch of parsley and 200ml of water. Bring to the boil and simmer over a low heat for 30 minutes. Pass through a sieve into a clean bowl and set aside. Heat 3 tbsp of oil in a medium-sized pan and add the remaining garlic, shallot and chilli and gently cook for 10 minutes or until the onion is soft and lightly coloured. Add the fresh tomatoes, crab stock, some seasoning and simmer until the mixture has reduced to a thick sauce. Finely chop the parsley leaves and add all but 1 tbsp to the sauce along with the white crab meat. Increase the oven temperature to 220c/gas mark 7 and spoon the mixture into the pastry case. 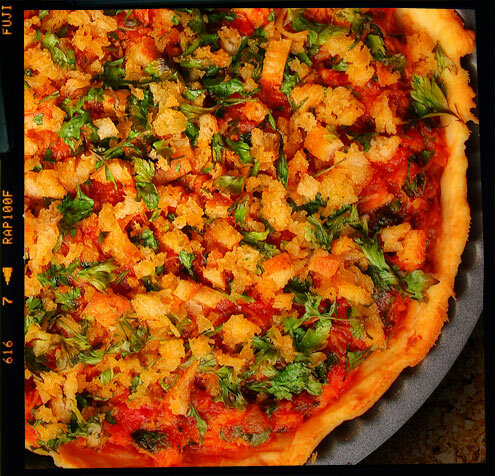 Mix together the breadcrumbs and remaining chopped parsley with 1 tbsp of olive oil and sprinkle over the top. Bake for 5-6 minutes until the topping is crisp and golden. Verdict: As mentioned at the top of the page, this is a stunning creation which is like eating a day out at the seaside. 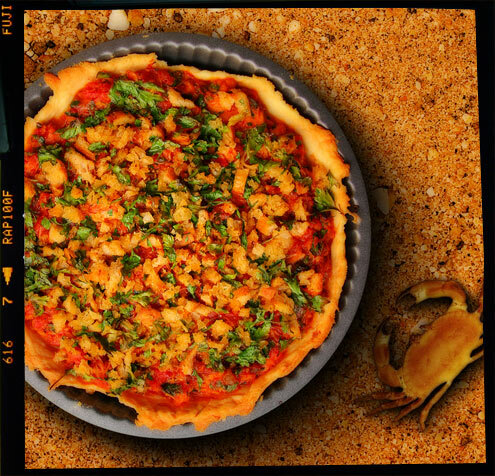 A sweet tomato and crabby filling surrounded by a crumbly butter-rich pastry. I take my hat off to Rick Stein (or the Spanish) for this is a work of beauty. Drink: Moderate (for a Saturday night). Entertainment: The start of the 5th season of ‘Homocide – Life on the Streets’. *Oh, and we also omitted the lard from the pastry (substituting with extra butter), because one of us is a strict vegetarian who wouldn’t dream of such a thing in their crab tart.